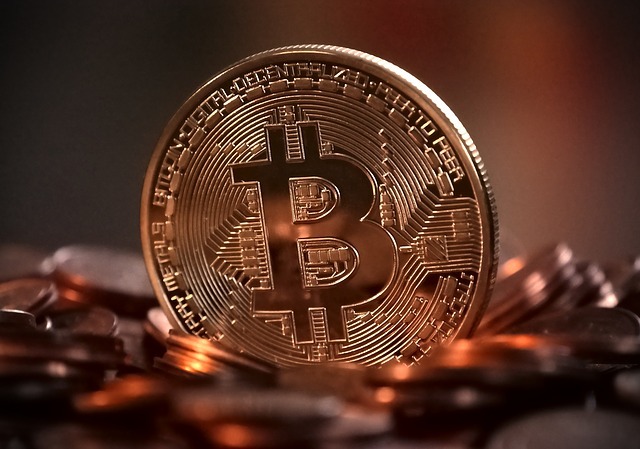 A recent article from The Sunday News sparked my curiosity about scams concerning cryptocurrencies. The story in question states that a former maid in South Africa is now making $15 000 every month after joining Bitcoin Club Network(BCN). The story caught my eye not because a maid was making money but it reminded me of pyramid schemes that are used to convince unsuspecting people to part with their funds with the promise to get rich quick. Ms Gagisa the beneficiary claims she was introduced to BCN by a friend and was unable to pass this opportunity by after being made aware of the benefits. She also went onto to explain how her lifestyle drastically changed since joining the club. Now I’m not saying the story is an outright lie but keep in mind that this is exactly how pyramid schemes work. There is always an enticing ‘rags to riches’ story designed to pull in those who have no knowledge about what they are getting into. The unsuspecting believers then fund the schemes payout and then everything collapses leaving members frustrated or even worse, bankrupt. I think this tale by Ms Gagisa could be one such scheme because it fits a pattern. Firstly the person in the article claims she was formerly a maid. Once a reader sees this the first thought that may come into their mind is, ‘If a maid could get in the big bucks this easily why can’t I?’ The schemers understand that people are prideful and most people who are better employed than house workers will fall for the trap. The vague nature of this story forced me to hunt for even more answers surrounding this BCN. 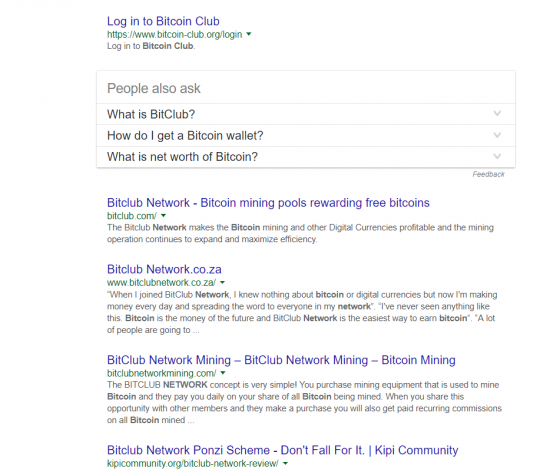 I quickly googled Bitcoin Club Network and the results do not seem promising. If a deal looks too good to be true then nine times out of ten it is. If you are going to invest in such projects PLEASE just try to verify how authentic the groups you are dealing with are before you commit your hard earned funds. What are your thoughts on groups such as the Bitcoin Network Club? Do you think they are running genuine operations? Let’s talk in the comments down below. Yes i agree with you e,g last year i was involved in Bitconnect with came out with great returns by investing high value of money but then this year its coin dropped from about $450 to $5 and just imagine you were holiding $200 worth of BCC . that will be a great loss. Other like Bitminex , Laser.online which acted as they are going to last for long # I lost money on those plartforms , but the best thing i do before investing is going a great research seeing which side most people fall under . But be alert they will also be an existence of bots which gives high number of +ve retains . Online money like Bitcoin is the latest rage in the tech world and taking the stock market by storm. But an Inglewood man says he lost his life savings after investing all his money in the digital currency. Hahaha, bitcoin IS the scam !! Bitcoin is NOT a scam.Fraudsters have long existed before Bitcoin. How much did you lose? LOL !!!! Anyone calling Bitcoin a pyramid scheme is misinformed and thinks Bitcoin and Bitclub Network are the same thing. In the USA Bitcoin futures are now traded on CFTC and CME. 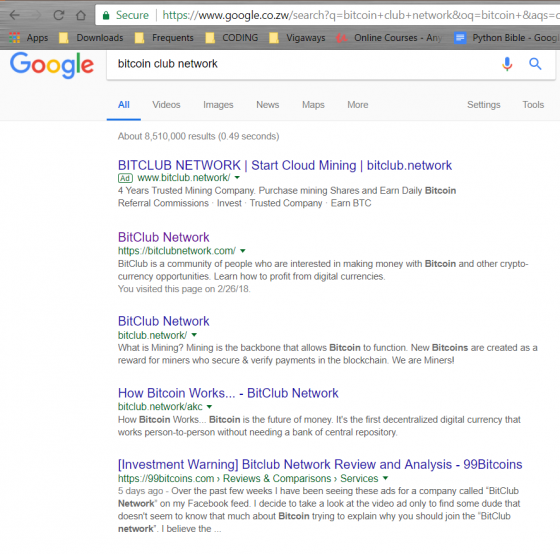 It’s unfortunate that bad actors like Bitclub Network and Bitconnect will dupe unsophisticated investors (usually poor people) into ponzi-like schemes in the name of Bitcoin. Allow me to welcome all Zimbabwean and other people who want to understand Cryptocurrency and in particular the one just got reservations on Magisa story! I am a Zimbabwean Bitclubnetwork Member for almost a year now and I would want to share with all those who want to know the in depth of Bitclubnetwork and please those who are free to whatsAp me I will add you to groups and I will explain on details with all the evidence on the credibility of the company!